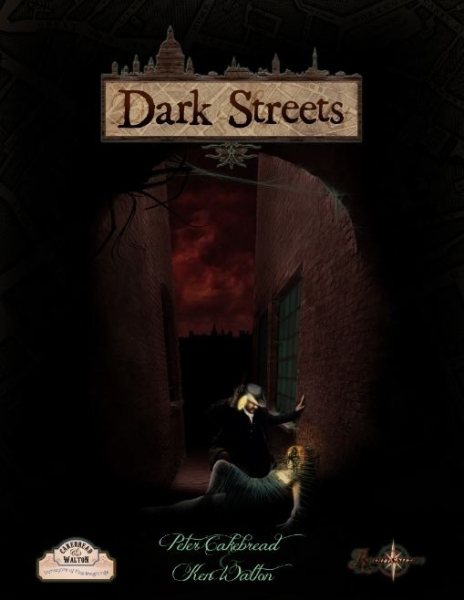 Dark Streets is a historical investigative horror RPG, powered by Renaissance, set in the Georgian era, written by Peter Cakebread and Ken Walton and published by Cakebread & Walton. Dark Streets is a setting guide for the Renaissance system, set in Georgian London with Cthulhu Mythos and investigative horror influences. I say influences because both of those items influence the setting, but don’t ultimately define it. In Dark Streets, characters take on the role of Bow Street Runners; hired hands determined to fight against the horrors plaguing the streets of London in its less-than-desirable areas. Some of these horrors are supernatural, some are Lovecraftian, and some are just thugs causing problems. It’s almost like taking the FBI and throwing it into 18th century London. I like Renaissance and I like Clockwork & Chivalry. However, I REALLY like Dark Streets. This is, so far, my favorite implementation of the Renaissance system as it combines some of my favorite gaming elements: horror, intrigue, dark secrets, Lovecraft, and action. Although I know nothing about Georgian London, the overall theme can easily by ported to other locales where law and order suffer and horrors could easily hide in the shadows due to the ignorance of the people and the willingness of the worshipers. The prominent concept that is quite unique to Dark Streets is playing the role of a Bow Street Runner. By using this role, the setting creates two important things: the characters have a very well-defined purpose and the streets rule. If a setting such as this were thrown into modern times, the police force and whatever special investigative force was created would quickly rid the streets of all these ruffians and whatever else is bothering the public. If the setting were placed earlier, the runners may not have the right tools to survive against so many antagonistic factions. By placing this setting prior to the Victorian era and after the English Civil War, the characters are given the tools they need to survive, but it’ll be a constant struggle as there are so many opposing them. Thus, the setting itself becomes an obstacle that the characters can overcome, but will always have to contend with. And this includes games where many aspects of the Mythos is removed (to balance combat, for instance). The gangs and cults could easily worship simple aspects of the occult, as opposed to the very overwhelming aspects of the Cthulhu Mythos, and the characters would still manage to have a difficult time surviving, but ultimately prevailing, against everything else within the setting. In other words, Dark Streets is a very compelling setting due to its very basic design elements of setting (Georgian London) and purpose (Bow Street Runners). There are a number of possible adventure ideas, with or without the inclusion of the Cthulhu Mythos. The era its set in is so fraught with danger, in an almost ridiculous way, that it’s hard to fathom that so many people survived it. There are gangs, political rivalries, religious rivalries, vice clubs, cults, corrupted law officials, radicals, and who knows what else. And just think, all of this is shoved into one city… Your adventures and campaigns could virtually go anywhere! I would love to take it to the Five Points area in New York.